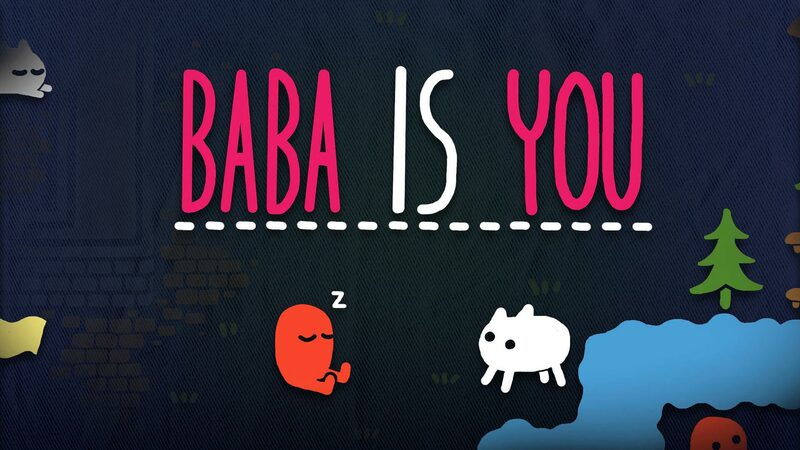 Baba Is You is an independent puzzle game from Finland, made up of hundreds of single-screen challenges. 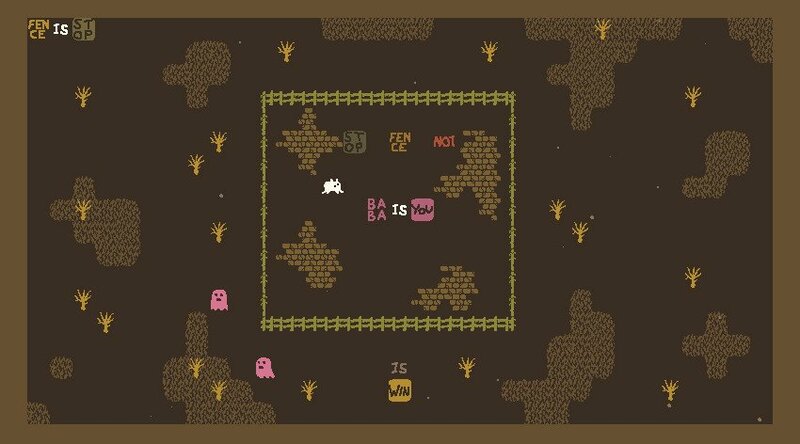 The Baba of the title is a chunky pixel art rabbit whose delightfully simple 1980s Atari aesthetic is reflected throughout the game. Players guide Baba around the screen, pushing certain objects and finding ways past obstacles. The aim, as you’d expect, is to complete each puzzle -- usually by touching a flag located in some hard-to-reach spot. Exactly how players do that varies wildly from level to level, however, thanks to the game’s ingenious central concept. You see, a lot of the objects you can push around are words, and these words also dictate the rules of each screen. The title of the game itself is a clue. BABA IS YOU. That phrase appears in every stage, but if you shunt any of the words out of alignment, Baba is no longer you and you can’t complete the puzzle. Push a different word into the sentence - to make ROCK IS YOU for example - and you’ll find yourself controlling any rocks that are on-screen. And that’s just the start of the surreal rule-bending you’re required to do in this game! Is that as confusing as it sounds? Nope! 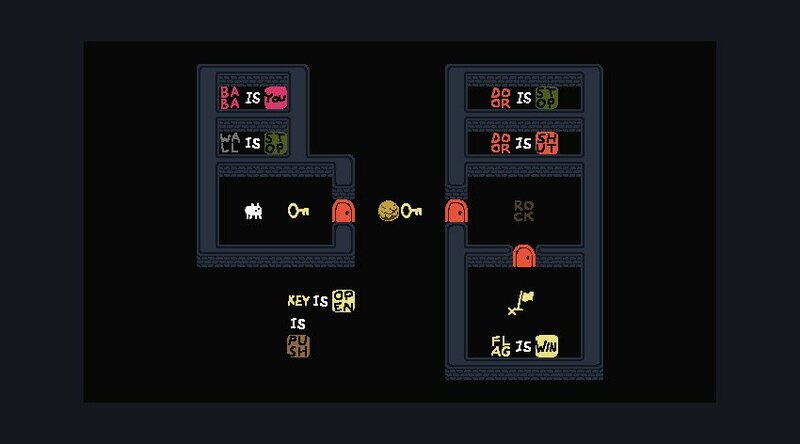 It’s a challenging concept to describe, but easy to understand when playing, thanks to a gentle series of introductory puzzles that help you explore the possibilities of this gameplay system. Knock the last word off WALL IS STOP and Baba can walk through walls as if they’re not there. Find a way to change FLAG IS WIN to something else, making a different object your goal, and you no longer need to reach the flag at all. The best solutions are the ones that feel like you really outsmarted the game, turning its own rules in your favor. The difficulty comes not only from working out how to change the rules, but how to get the words you need into the right place, one shove at a time. After that reassuring tutorial, puzzles rapidly become much more complex and require brain-bending lateral thinking to pass, as scenery and deadly enemies are positioned to make the obvious solutions seemingly impossible. Key phrases might be tucked in corners, where you’re unable to change them. Or so it may seem. Every level has a “eureka!” moment waiting to be discovered, that flash of thrilling inspiration that turns your perspective on a problem upside-down and makes you laugh out loud at the audacity of the solution. 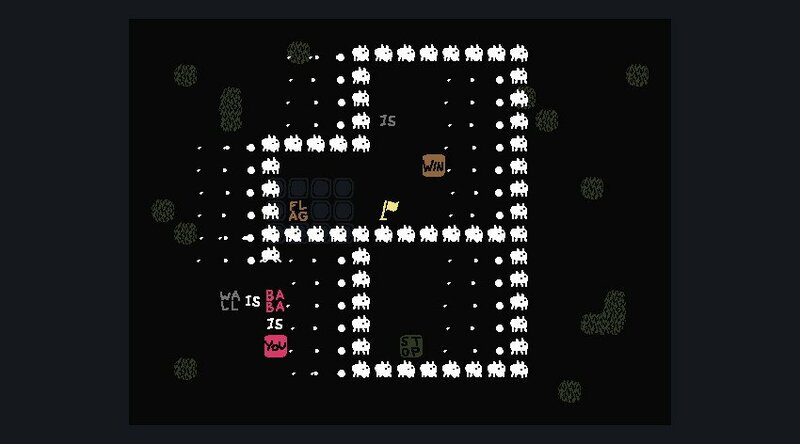 For example, one early level can be beaten by taking control of all the walls that are blocking your path and literally “walking” the entire structure across the screen. It’s that sort of “outside the box” brilliance that makes those hard earned victories so sweet. Still sounds tricky! Is this too hard for kids? Younger children will probably struggle if playing alone, that’s for sure. The difficulty ramps up early. Older children, especially those who are fascinated by methodical investigation and lateral thinking problems, will fare much better. Having said that, you’ll be surprised at how often a solution can be found by applying the simple clarity of an inquisitive little kid. “Why not just do this?” will lead to a breakthrough more often than not. Thankfully, when players are completely stumped, the game is constructed in such a way that you’ll never be stuck permanently. You can always undo your past actions by holding down a key that rewinds everything you’ve done, or you can simply reset and start over. New stages open up in batches, so if one puzzle is driving you nuts you can return to the map and try another instead. It’s also a game that has inspired lots of online guides, so if you absolutely get stuck -- and don’t mind spoilers -- progress is always a Google search away. We found that Baba Is You is a great game to play together as a family, with one person on the controller and everyone else shouting out suggestions of what to try next. Despite technically being a single-player title, it proved to be a surprisingly exciting party game when played this way, and the old adage “two minds are better than one” often bears fruit here. It’s immensely satisfying to crack a puzzle by yourself, but even more enjoyable when you collaborate your way through. Baba Is You is tough, no doubt, but it’s also one of the most engaging educational games we’ve seen in a long time. Baba Is You isn’t based on any school curriculum, but it is definitely educational in the sense that it demands your full attention and brainpower. Certainly for kids interested in Computer Science, the fact that the game is built around manipulating and understanding rudimentary forms of Boolean logic -- “if X then Y” -- means that kind of problem solving soon becomes second nature. It’s the sort of game that leaves you feeling smarter! Baba Is You is best enjoyed by those who prefer a stiff challenge and don’t expect to glide through levels without straining themselves. If that applies to you and your kiddos, then even just a handful of the hundreds of mind-boggling puzzles contained in this game will give you hours of head-scratching entertainment.